The Dutch trend watching agency Trend Agency Move has recently launched their trend book ‘Fashion Movement – The Sustainable System Unmasked’. This trend book explains the trends and developments for the next five years on a sociocultural- and a market level. Innovative trendsetters are spotted by trendwatcher Renske Mennen. This book makes clear what the upcoming trends are, and how they are analysed. What are the ideations of the trendsetters, and why is this so impactful for the future of the sustainable fashion system? How should you, as a company, respond to the sustainable fashion system, which is in transition, so you won’t lose contact with your customer? These questions are answered in this trend book. To summarize: this book offers new conceptual ideas for businesses and organizations with regard to current trends and developments. This way you stay connected to your customers in a trend-conscious way. 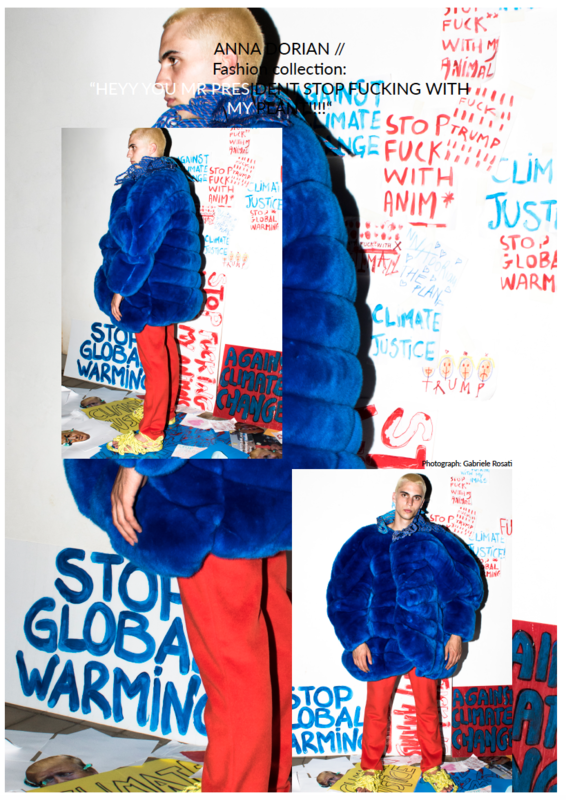 “Fashion Movement - The Sustainable System Unmasked”shows the rumour in the industry. Where rumour is, is a trend. Four sociocultural value-trends are explained, and every value-trend has an underlying market-trend, which is also explained. Altruistic Protestismis one of the sociocultural trends. Dissatisfaction is a synonym for our current time. But there’s a desire for change. That’s why a lot of protest is going on. Look for example at the work of fashion designers Anna Dorian, Duran Lanink or Sophie Roumans. They are openly and shamelessly protesting against our current society. As a result, circularity is one of the fastest growing market trends in terms of sustainability. Library-like fashion memberships are currently gaining success. Not only garments will be re-used. The re-use of materials is already a thing. For example human hair, fish skins and bacteria from agricultural waste are our future fabrics for garments. Besides these trends, the trends Equality of Nature’s Creatures, Radial Nakedness and Emotional Qualitismare also deeply explained. Especially for this trendbook, a soundtrack was produced by music producer Rick van Bruggen, also known by his artist name ‘Ick’. Changing trends are the result of certain feelings of a society. The music track triggers the senses, so you have an experience of the meaning of the trends on a deeper level. Look for example at the cover of the trend book ‘Fashion Movement’, which is designed by Amber Jae Slooten and Kerry Murphy. They co-founded The Fabricant, a digital fashion house, and are creating design without wasting any material. It is a possible scenario that the lines between the online and offline life will blur so enormously, that we’ll only wear one physical garment every day. When you’re listening to the mysterious music track of Ick, you hear some natural sounds transforming into plastic, digital sounds. The music is another way of explaining the trends and developments of nowadays. The digital trendbook can be found at http://trendagencymove.com/#shop, and costs €80,00, music track included. For more information trendwatcher Renske Mennen can be contacted via renske@trendagencymove.com.